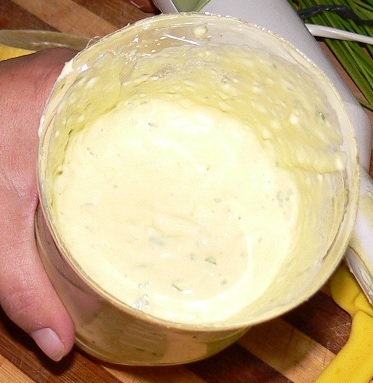 Alioli is a delicious garlic & mayonnaise sauce you can use for several purposes such as a dip, a sauce to go with meat, fish or potatoes or to spread on bread instead of butter. In Gran Canaria this is typical starter and each chef has his own special recipe. Alioli is really easy to do and it’s done in just a few minutes. You need a blender and the jar that comes with it. If you don’t have a tall jar you can also use a cut-off 1.5 litre water bottle. Peel all the garlic cloves and place them in the jar. Add the oil, salt, pepper, parsley and egg. Here a nice trick to peel the garlic: Put some weight on the clove with a knife, the skin will snap and come off easily. 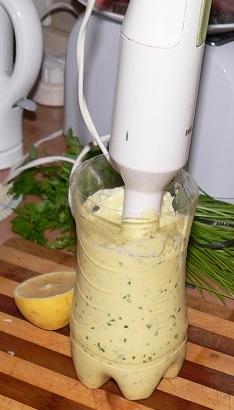 Place the blender on the bottom of the jar, blitz continuously and start moving up and down. You will see the mixture thickening. Once all the oil has been mixed in add the lemon juice and blitz again for a moment. When the mixture is thick and hardly moves in the jar it is done. If the mixture splits (for some reason) add another egg. Alioli will last about 3-4 days in the fridge. The flavour is really hot at first, but it mellows down after 24 hours in the fridge. Alioli is not recommended for pregnant women or small kids, because it contains raw eggs. Witout Egg: You can also make Alioli without egg. 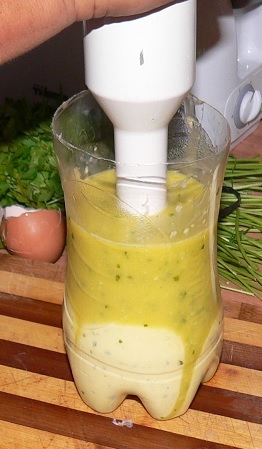 Instead of the egg, you add 100 ml of milk but reduce the olive oil to 200 ml. Green Alioli: For Green Alioli you use fresh mint leaves or fresh basil leaves instead of parsley. You can also substitute the lemon with a lime or orange and the taste becomes immediately a bit different. Other Variations: Add some coriander (cilantro), sun dried tomatoes, red pepper, mustard and oregano or red paprika. Wasabi, chipotle or sriracha are great options for those who want to make a hotter, spicier sauce. Vegans also have their own version of this sauce: Use raw cashews (soak them in water for an hour at least), roasted garlic cloves, apple cider vinegar, lemon juice, mustard, olive oil, water and salt. And of course you can add different ingredients to make variations for vegan as well. 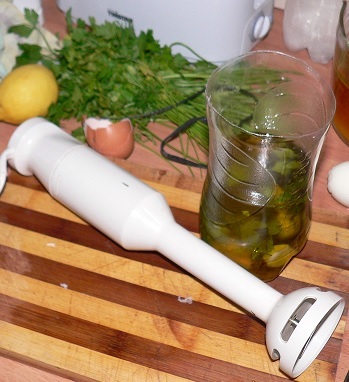 Whichever version you choose, Alioli is quickly made and a great addition to any kind of dish. 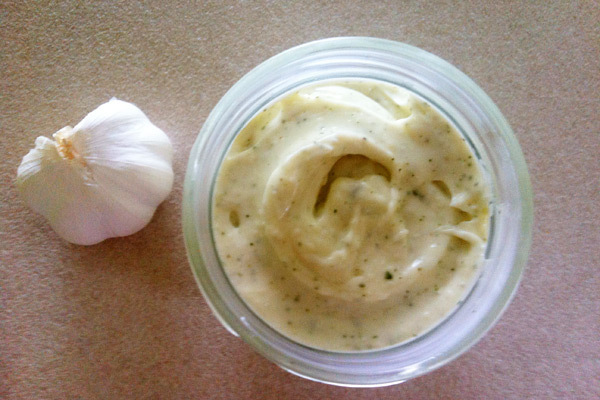 Garlic is a great way to prevent that nasty winter cold, so this sauce is also an excellent option for those who love garlic. And don’t worry, most Canarians eat garlic on a daily basis, so nobody complains about garlic-breath. Hi, my name is Kirsi Markkula and I am from Finland. I came to live in Gran Canaria in May 2013.